As Sonic celebrates his birthday with his friends, a mysterious being known as the Time Eater suddenly appears, destroying the party and sucking everyone through various "time holes", scattering them across different places in history. Sonic tries to stop him, but the monster easily knocks him out. After regaining consciousness, Sonic finds himself in a strange dimension known as 'White Space', a realm where time and space ends up after it has been 'erased' by being drained of color and life. As Sonic searches for his friends, he encounters his younger self, Classic Sonic, along with a younger, Classic Tails. As the two Tails determine that Time Eater's actions are damaging time and space itself, both Classic and Modern Sonic race through their history, restoring time to normal and rescuing their friends. After restoring the worlds and collecting all the Chaos Emeralds, they discover that the mastermind behind the now perfected Time Eater is none other than Dr. Eggman. Best sonic game I've ever played. 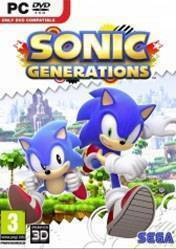 Has a great story and levels from past sonic games. I also like that there are challenges in the game that you can do apart from the normal levels. I also like how you can play with two sonics. Great game has very good levels from past sonic games and the music is also good. I like how you can do missions in the game apart from the normal levels. I recommend this game to everyone! Better than Sonic Forces in many ways. On PC, you have 60FPS, even 4K (if your PC can handle it) and MODS! You can literally play Sonic Unleashed levels on this! A must get if you're a Sonic fan! Great sonic game to play. Gameplay, places, mods and controls are pretty good. The story and some of the physics aren't and there are some glitches from time to time. This is easily the best Sonic game out there. Sega made a masterpiece with this. The story is average, but the gameplay is phenomenal. The controls are smooth and work well, though you need a controller to truly enjoy them.